Look ’em in the eye. Make a gesture of inclusion. And above all, have a chorus. Those sentiments stood out for me in the countless tributes that have been paid to this American Tuning Fork over the past days. While Pete often spent his time on the ragged edge of political issues, I believe his powerful skill at connecting with audience ought to be remembered and memorialized. His simple methodology transcended crowds and lay the framework for connectedness, relationship and above all transparent passion for a cause – oh yes, and for his music. Pete was a prolific songwriter and created music sometimes popularized by others while at the same time, bringing awareness to strong civil rights tunes that had a chorus. I had the good fortune of seeing Pete perform years ago yet it is in the epitaph, that I am most touched. Today I will look to connect with my audience, be it one or many by looking them in the eye, making a gesture of inclusion and finding our chorus. My beloved friend Becky, who died 3 years ago Feb 7, was a huge Pete Seeger fan – he autographed her banjo and they sang a song together. I was so sad when he died, but comforted thinking of the celestial jam. Thanks for this great post! Wow, so great that Becky got to sing with him – another example of his gift of inclusion. What a lovely tribute! Thank you, Tammy! brings new (or old) meaning to “out of the box”, doesn’t it Nancy? Pete Seeger was such a great musician and song writer. Your tribute is beautiful. Thank you for posting a tribute to Pete Seeger, Tammy. I have learned so much about his life over the past few days, and the more I learn, the more impressed I am. As a child, my mother took me to see one of his performances in conjunction with the Clearwater, his sloop that traveled along the Hudson River to raise awareness about the state of that majestic body of water. Most recently, I saw him perform alongside Bruce Springsteen at the “We are One” Inaugural Celebration at the Lincoln Memorial in 2009. What an amazing life he had, and what an amazing gift he was to our world. Well, aren’t you the bomb seeing the whole Clearwater thing? I’m envious of experiences like that one! I was very lucky to have grown up close to the Hudson River. I’m glad that you were able to see him perform – where was it that you saw him? in Denver but I can’t remember the venue. I do remember a lady behind me opening a can of tuna fish and eating though. It was indoors so she was rather pungent. Nice Tammy. I was a fan of Pete’s too. We are all lucky to have his songs in our brains. And a hammer in our hearts! It is supposed to be very difficult and that may be the reason that he said his best accomplishment was his “how to play the banjo” book. I don’t remember the exact title but I’m sure it is selling well this week. Thank you, Tammy, for the great tribute to a talented and warm-hearted individual. I, too, learned a lot about Pete and was especially touched to hear he worshiped and was VERY much in love with his wife, Toshi. NPR interviewed Pete’s godchild – a great and informative interview. Thank you!!! The NPR interviews were well done and you know, Toshi only past a few months ago. So great that his grandson is a musician also. How lucky you were to see him perform. I was the hugest folk music fan growing up! I still love it. I listen to coffee house on Sirius. beautiful post, Tammy. 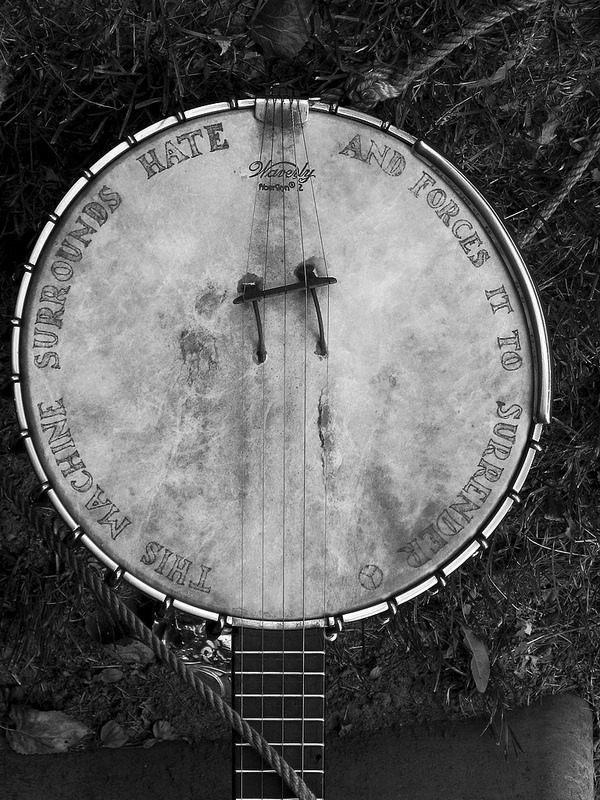 I love the image of his banjo, and the words of advice. What a long and fruitful life he had. Indeed Nancy. His banjo, his words, his unassuming demeanor and fiery desire to right the wrong – all assembled in a beautiful love story and told through the generations by his grandchildren musicians. What a beautiful tribute. Truly a powerful voice. I grew up singing his songs, although most of them on my parent’s Peter, Paul and Mary records. That was my first exposure also Jane – thru P,P&M! They made hits of a couple of his songs. the rainbow bridge and is jammin’ with Woody and Leadbelly now. Wow – what a show and it’s good to know that his ability to connect made it right through the TV too. I feel blessed to have seen him perform.